A quick post to show my progress with the Hemp summer cardigan. It’s coming along quite nicely. I haven’t worked on it for about a week, so I’m not sure when it will be finished. I’ve actually got a grand total of ten unfinished projects at the moment – 2 blankets, 2 toys, one pair of socks, two shawls, 2 cardigans and one cowl. I’m going to try not to start anything else until I’ve finished 2 or three more things. That is just lovely. I can’t quite tell – is it dark blue or black? Either way, I can’t wait to see the finished result! I love this cardigan. I would love to get your pattern and maybe start my own. Is it pattern available anywhere? I really love the hemp top. Have you worked out a pattern for it yet? I would like to use it or even purchase it from you if at all possible. It looks like something I would wear all the time. 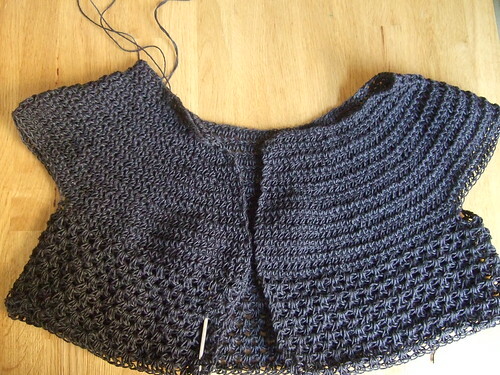 The body of the hemp top is a very interesting stitch. What is it? It really looks nice.